While the long-standing mode of transportation to the Balloon Fiesta is by car, the wait times and lines for parking are long. Public transportation makes getting to the Albuquerque Balloon Fiesta much easier. Consider taking the Park & Ride shuttle or climb on your bike for the free bike valet service. There are several spectacular tour options as well. 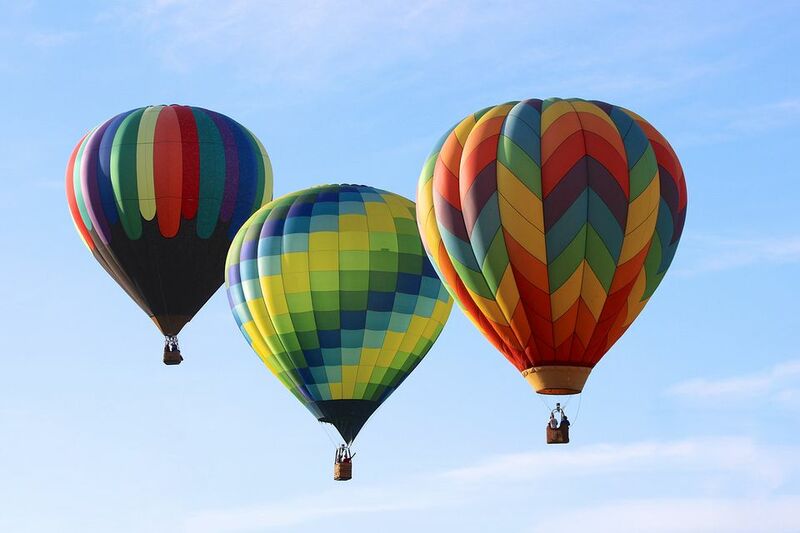 There will be several places throughout Albuquerque to park your car and ride to the Balloon Fiesta, all within plenty of time to see the balloons rise. The Park and Ride option include the bus ride to and from the Balloon Fiesta Park as well as admission to the Fiesta. When: Entire Fiesta, with the exception of Monday, Tuesday or Wednesday morning sessions. Weekdays: Buses begin at 5 a.m., with the last bus leaving the remote parks at 7 a.m. Weekends: Buses begin from lots at 4:30 a.m., with the last bus leaving at 7 a.m.
Airport Parking I-25 & Sunport, 1501 Aircraft Avenue SE, follow signs off Aircraft Avenue. Hoffmantown Church, 8888 Harper NE, park in NE lot only. Coronado Center, 6600 Menaul NE; Park in SW corner near San Pedro. Intel, Highway 528, Rio Rancho; Park in the southern parking lot. Enter the lot at either Westside Blvd. or 21st Street, follow the signs. At Park and Ride remote lots. At remote lots, credit cards only; no cash. To purchase tickets with cash, use the Balloon Fiesta gift shop, 4401 Alameda NE. Call (505) 821-1000 for more information. Balloon Fiesta is a weather permitting event. There are no refunds. However, keep your ticket as a rain check in case the individual event is canceled by AIBF, Inc.
International ticket purchases can be handled by calling 1-877-569-7767. The Balloon Fiesta has teamed up with the Rail Runner. Ride the train to the Los Ranchos/Journal Center Station. The Fiesta Express Park & Ride bus will pick you up and bring you to Balloon Fiesta Park. This service is available on weekends only. All tickets must be purchased in advance. Purchase the Rail Runner/ Balloon Fiesta combo ticket online. If you enjoy biking, then take advantage of the city's many bike trails to get to this year's Fiesta. The Balloon Fiesta will provide a free bicycle valet service during the nine days of the event. A bike trail runs along the AMAFCA North Diversion Channel, crossing under Paseo del Norte and Alameda Boulevard. It continues north, crossing from the west to the east, and ends just north of the Balloon Museum. The bike valet parking station will be located on the northeast side of the grounds. Consider the bike valet service as a kind of coat check for cyclists. What could be better? No driving or parking hassles, no taking the bus, and a healthy bit of exercise. This is a true green alternative. Morning sessions for the bike valet station are from 5:30 a.m. to 10:30 a.m.; evening sessions run from 5 p.m. to 9 p.m.
Bikes not picked up from the valet service area will be removed and stored and owners will have to call (505) 821-1000 and arrange to pick the bike up. For your safety, remember that part of the ride will take place in the dark. Be sure to wear a helmet, and that your bike is fully outfitted with headlights, taillights and rear reflectors. The Rail Runner will be running its regular schedule, but there will be NO connecting bus service to the Balloon Fiesta. It's possible to take the train to Sandia Station if you have a ride from there. The Fiesta has several alternate ways to get to the festivities. Hop on a trolley for an evening tour, or take a bike in to watch, getting in a bit of exercise. Either way, they offer a tour as well as other special amenities. Valet bike parking is free.